The Farmer, consists of a panel painted with the text of Wendell Berry's poem, "The Man Born to Farming." 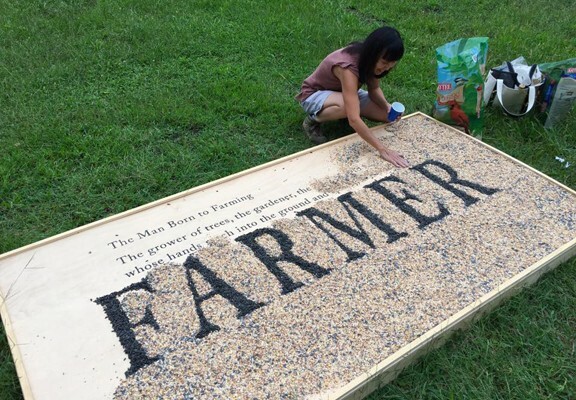 Seed covers this, spelling out the word "Farmer." Over time, as birds and animals consume the seed, the poem below is slowly revealed. Similar to the seed that farmers use to grow our food, this piece will feed the resident wildlife as well as give reflection on what a farm provides. Placed in "Francis' Garden" the installation also serves as a tribute to the many dedicated years of farming that Francis Du Voisin has given to Perry Farm.